Çanakkale Çimento Sanyaii AS placed an order with Siwertell for a ship loader and shore conveyor equipment. 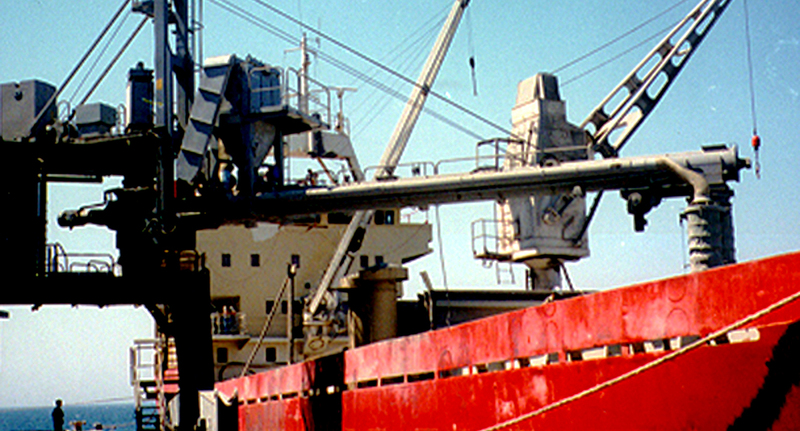 The travelling loader was mounted on rails at the Çanakkale Private Port prior to taken into operation. Cement is fed to the loader via a belt conveyor and a tripper, which transfers the material into a horizontal screw conveyor. From there the cement is conveyed to the outer end of the horizontal arm where the spout is connected. The outlet of the loading spout is the most critical point of a loading system. Cargotec designed the spout with a central telescopic chute and a flexible outer sleeve. The cement falls into a central chute while dust laden air, captured within the lower skirt, is drawn up safely through the flexible outer sleeve to the dust collector, mounted above the horizontal screw conveyor. From the dust collector the cement is conveyed into the screw conveyor by a rotary feeder arrangement, and the material is returned to the hold of the ship. The lower skirt captures dust laden air and ‘calms down’ the falling cement when loading open hatches. By raising or lowering the spout, the skirt is always in contact with the cement. An automatic level control system indicates any overfilling in the chute. In order to further reduce dust pollutions and provide environment- friendly operation, the Siwertell loader is prepared for closed hatch loading of ships. If a client wishes to load a ship through openings in the hatch covers rather than through the open hatch, the automatic level control is used in the hatch. With the skirt as an extra seal, the cone will fit to the openings in the hatch covers of the ship. In this way an enclosed loading system is obtained. The Siwertell ship loader is a light weight machine. One of the design criteria for siwertell’s engineers is to keep the weight down as much as possible without jeopardising strength and quality. As a result some improvements to the steel structure have been made for the Siwertell loader. The horizontal screw conveyor is strong enough to be self-supported.